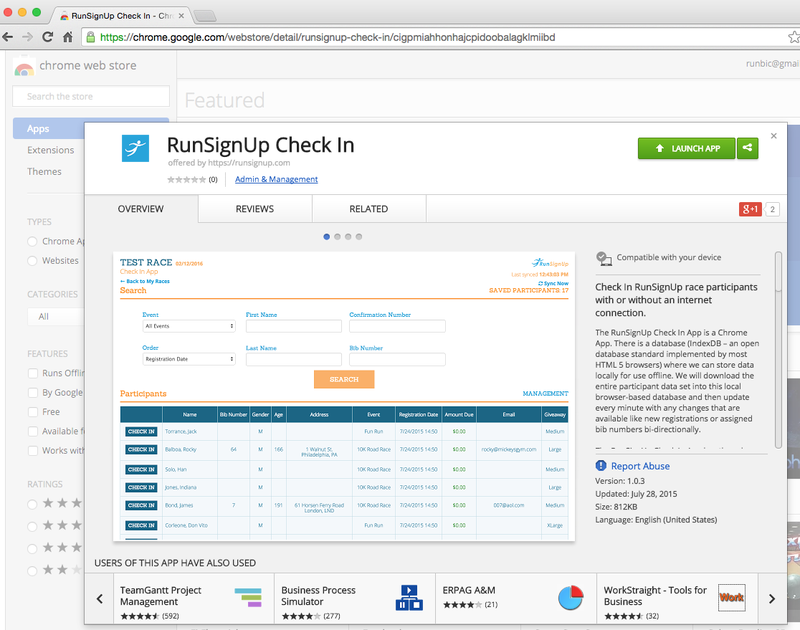 The Free RunSignUp Check-In App is now available for download on the Chrome Store, or available at RunSignUp.com/CheckIn. This app has already been used by 10,000 participant races. We have also developed a set of hardware recommendations. The Chrome App Check-In is one of three alternatives, including a pure Web version and a native Apple and Android App. Auto-Sync – the app will auto-sync in the background so even spotty Internet service will work. Off-line Mode – this means you do not need to rely on an Internet connection. Manual Sync – Click a button to initiate a sync operation manually. Local Save to USB – You can save information to a USB, so if you are assigning bibs you can import them into your Scoring software like The Race Director or RunScore. Fast Searching – since all the data is local you have reliable, fast searching. Dynamic Bib Assignment – simply type in the bib numbers as you hand them to participants at the expo or on race day (no wasted bib tags!). Waiver Check-In – make sure your participants have signed their waiver and check when they sign it on race day. Bar Code Readers – You can speed check-in with barcode readers. Send emails before the race with participant barcodes. Label Printing – Print bib labels on the Dymo 450 thermal label printer to speed professional check-in with dynamic bib assignment. Auto-sized Label Printing – put all the information you want on your bib labels – we support auto-sizing of the font to fit the label. Receipt Printer – print inexpensive thermal paper receipts that your participants can take to the Giveaway and Add-On Pickup area to speed check-in and reduce lines. Customize Search Page – select which columns you want to show on the search results page. 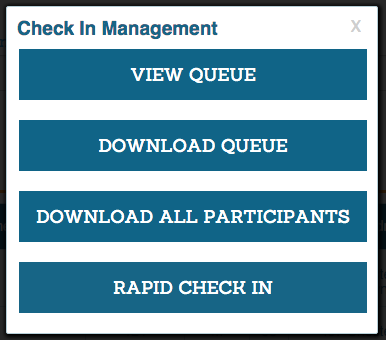 Customize Check-in Pop-Up – select which data you want to show in the pop-up to check people in. Customize Edit Fields – select which fields check-in volunteers can edit. Super Fast Check-In – No pop-up option – just search and click. Or scan barcode and done (like entering a ballpark or concert). Linked Registrations – Allows you to find all the people who registered in the same transaction – like a family – with a click of a button. Search by Team Name – Find everyone on a team easily. Mark Manual Payments – Record cash payments taken at check-in. Reports – This will give you the ability to report on check-in stats and even track on a per station basis. Free and Open – There is no charge for the Check-In App. In addition anyone can create a race and upload participants for free even if the participants are imported from another registration system, and the app would fully work. Also, since this is updating the common fields used in RunSignUp it integrates well with scoring and timing software like The Race Director, RunScore and RunScore Results and Agee Timing. The Check-In App The Check-In App is a Chrome App. There is a database (IndexDB – an open database standard implemented by most HTML 5 browsers) where we can store data locally for use offline. We will download the entire participant data set into this local browser-based database and then update every minute with any changes that are available like new registrations or assigned bib numbers bi-directionally. Chrome supports Apps – so you can download the app onto your PC, Mac or Chromebook. iPad, iPhone and Android do not yet support Apps in their browsers. We will be releasing a Chrome browser version that supports any Chrome browser – PC, Mac, iPad, iPhone, Android tablets and phones, Chromebooks, etc. Check-In App from the Google Chrome Store. This is required if you want printers to work – and printers also require a Windows (like a Netbook) or Mac computer. Printers are NOT supported on Chromebooks. 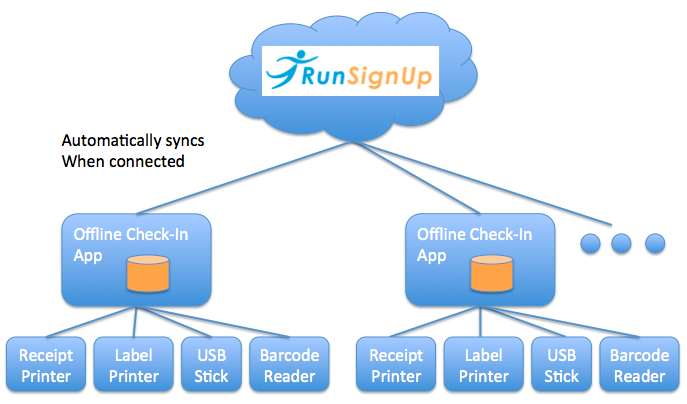 RunSignUp.com/CheckIn for any device (mobile or computer). Use Chrome on most devices, but use Safari for iPhone and iPad (yes, Apple limits the abilities of Chrome on their devices). Password. 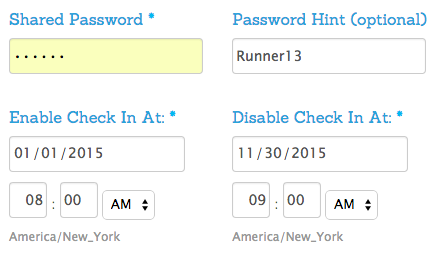 Your race will appear to all users of the app, so you must set a secure password. We suggest that you set up a Password Hint (I just use the actual password so I do not forget it and only the race director can see this password). Dates. You need to set dates to turn it on and off. This can be a tight window on race day morning or an expanded window if you want to test it before the race. Step 2: Set Up Check-In Options. We have quite a few since there are so many different needs for races. 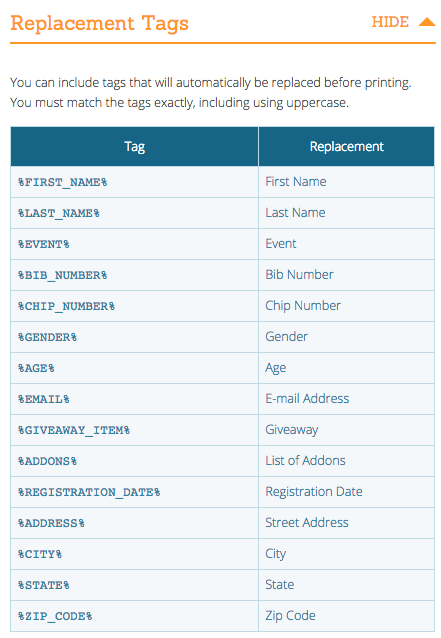 The first thing to set up is which fields (like name, bib, registration date, etc.) appear when you do searches, which fields appear in the Check-In Pop-up, and which fields can be updated/edited like Bib and Waiver. 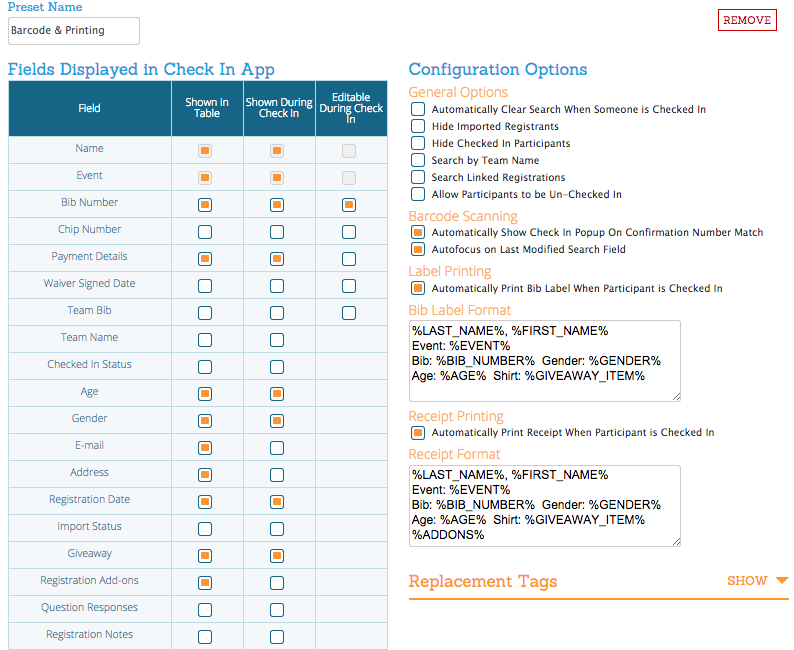 You can see the set-up options on the diagram on the right with the large list of checkboxes being the fields that are shown. Note there is a default set of fields if you do not set this up. Note also that you can set up any number of “Presets” and name them anything. For example, you might want to have limited information and editing for most of the check-in stations and have one station that has many more options turned on. The options on the right include some general settings that can make check-in faster for your process. They are all fairly self-evident, but several interesting scenarios can be set up. For example, you may want to have most check-in stations not be able to un-check-in people and have one station that can solve problems and have the capability to un-check-in people. This can reduce options and errors. Another scenario is to have one or two stations set up to handle all the team check-ins so they would have the “Search by Team name” turned on and the other stations would not. Barcode Scanning can also be set up. The first option will automatically pop up the check-in box when the barcode matches a person. So you scan, enter the bib number, click Enter and you are done. The second option places the focused field on the search screen where it was – typically the Registration ID field so the barcode is ready to scan again quickly. Label printers are great for doing dynamic bib assignment where the bib label will print out when you assign the bib number and check the person in. Simply peel the label and put it on the bib for a professional look. We also allow you to format the bib label however you like with a combination of text and database elements like name and bib and shirt size being able to be inserted onto the label. For example: Bib: %BIB_NUMBER% We support the Dymo label printer with dynamic scalable fonts. Meaning if you only have a couple of lines of limited text the font will be large and if you have a lot of lines with a lot of text then the font will be small. Receipt Printers can also be connected and configured similarly to Label printers. Below is a list of fields that are available for both printing types. Note that you can print a list of Add-Ons that the participant ordered – so they could take the receipt over the the Add-On table to pick up their extra purchases as well as giveaways. Step 4: Using the Check-In App. 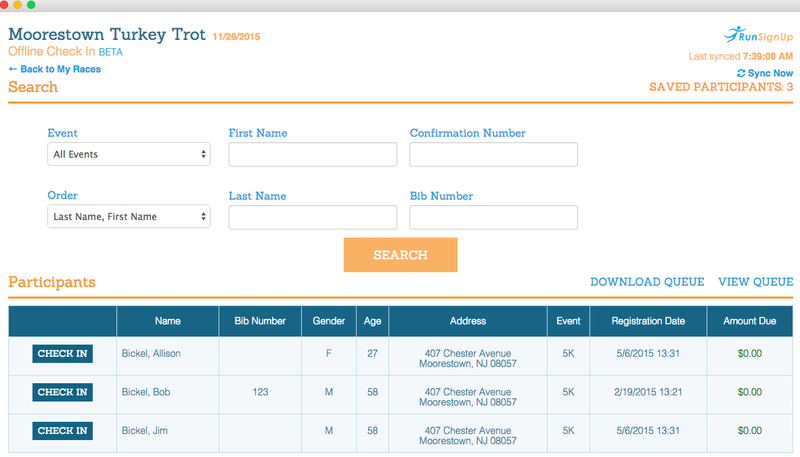 The app will initially look like this: When you click on “Add a Race”, you will see a list of races as shown on the right. Note that all races who have the Check-In App enabled will show on this list. This means you have to enable your race so it can connect to the app. The first thing the app does is tries to sync with RunSignUp and download all participants (this can take a couple of minutes for a 10,000+ person race, so make sure you do this before going on site where Internet may be spotty). You can keep track of this in the upper right corner of the screen – it will show you how many it has downloaded. It will also show you the last time it was synced. The syncing happens automatically when connected, and you have the option to “sync now” if you are trying to load in new participants that may have registered in the kiosk. Since all the data is now in your local computer or device, searching is consistently fast. For 1,000 people, it is typically about 1 second. With 18,000 people it can be about 3 seconds for a search. As explained in Step 2, these pages can be configured a number of different ways. For example if it is important that you check to see if everyone has a waiver, you can show that. You can also have people sign waivers on site and then have the check-in staff mark that the waiver was signed – allowing for simple post race reporting of waiver coverage. 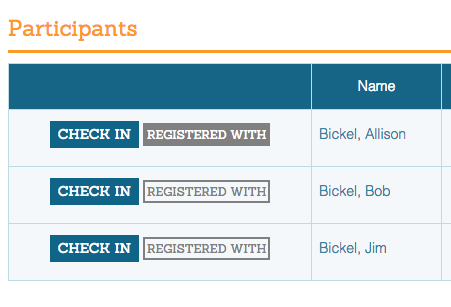 A convenient feature is to show the participants that registered together. In the Step 2 Setup above you can select to show “Linked Registrations”, and it will show in the search results in the app as seen on the right. We have a rapid check-in mode for simply entering the barcode. This is enabled int he Management pop-up. Scanning the barcode just checks people in and you go to the next person – just like when you go to a concert. It automatically shows a list of people who are checked in. can you just send me the waiver to sign?